The total experience. See it, eat it, dress it, etc. The world could use more places of business striving for more immersion, because, to be blunt, people like to escape into a different place for an hour or a day. And while we don't need to dress like a head of broccoli while shopping for groceries, we do like a museum show where we can go and eye amazing objets and then dine on dishes themed to match the exhibit. 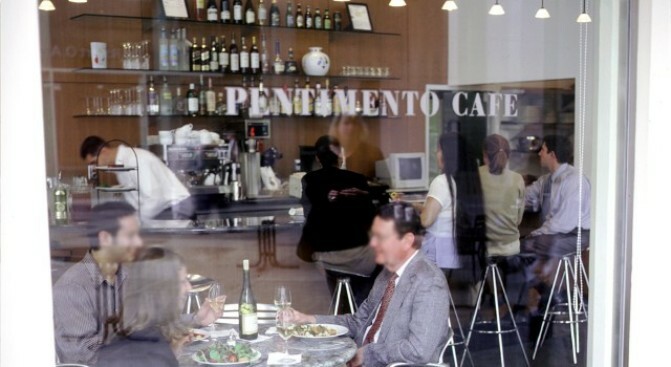 Pentimento at LACMA is going the delectable distance right now with several offerings that are paired with the Pompeii exhibit, which opened at the museum on May 3 and runs through October 4. There's the Pompeii Caesar with thyme "ash" (museum's parentheses), as well as a panna cotta dessert made with rosemary syrup. Those Pompeians, prior to Vesuvius erupting in 79 AD, were quite the sybaritic bunch, or so history tells us, so we're guessing the sumptuous supping cleaves well to the level of dining going down in the ancient village. Did we mention the fig compote and Italian cheeses? Because we must always type the word "compote" when opportunity presents itself. And when we find a compote, with cheeses, we enjoy. More compote, world. More compote.